So now that I’m focused in on what I want need to accomplish this year. It’s time to get my ducks in a row. 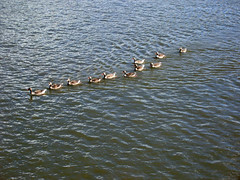 Why is it when ducks fly they fly in a V formation, yet when they swim it’s in a straight line? It has to do with resistance…and when it comes to implementing new technologies….you better know if you need a V or a line. Tomorrow I have the privilege of handing out 42 laptops to teachers who filled out a form last year basically turning over their lives to me for the coming year (although it was worded must better than that 😉 ). So the past couple of days I’ve been getting my ducks in a row so I can make sure we support these new laptoppers the way they need to be supported. Step 1: Each person will meet with me or one of the other Educational Technology (ET) support staff and fill out their Individual Educational Technology Plan (IETP). Think about the individual plans you fill out for students…only for teachers focused on technology. Each teacher will choose two or three NETs for Teachers standards to focus on for the coming year. We have a nice little IETP form that will be used to track their progress on meeting these standards throughout the year. Step 2: We will create Laptop Support Teams where groups of 4 or 5 will meet with an ET twice a month. These groups will be used to trouble shoot problems, discuss ideas, and help to form a support group for each individual as they learn how this new technology affects teaching and learning in their classroom. Step 3: Throughout the year we will be collecting data from this group and sharing it with our stake holders on a quarterly basis. So that’s it. Of course there are many other things we’ll be doing too. Like holding after school technology sessions for teachers, and 10 minute tech tips during staff meetings…and of course meeting with all teachers and supporting them in the use of technology in their classrooms. This is just one part of a much larger project that is going on this year…but it’s a key part as getting these ducks in a row is just the beginning of a larger technology vision. Best of luck to you with your laptop project. Your teachers are very lucky to have you working with them. share that form you have having them sign?? I must say, I enjoyed your previous thread too. I am always curious where the people who post are living, their ages, demographics and that sort of thing. Must be the repressed sociologist in me. Down Boy! So as one of my few posts I’ll try to be brief. Like you teacher folks I work in a world where most adults loath the computer, and especially the drawn out computer classes that the technorati put on. A majority hate them because they will never understand, and the few hate them because they understood within the first 5 minutes of the four hour block. So on to my point. I think you are a genius… (but that’s nothing new) I like how you give them an opportunity to work it out on their own, with their peers, and at their own pace. I also think it is important to give the quick down and dirty ten minute tips. Its a great way keep everyone from being overwhelmed. And in ten minutes you can’t tackle some hail-mary lesson on programming that no one would remember anyway. I got the job by the way. It sounds like a solid plan, way more than most teachers get when they are handed a laptop! Have you thought about including a student on each Laptop Support Team? You probably have some of them working on support anyway, and it would reinforce the idea of the inclusive learning community. While of course people want to work on some things on their own, I think one of the hidden messages of teacher-only PD is that mistakes are shameful and their own learning should be hidden from students. Jeff, I think you have the making of a very successful project. You started out well with asking people to participate, so you have the ones who want the opportunity. You have broken it down into peices that are manageble and attainable during the course of the year. Having the particpants chose two or three NETs for Teachers as their focus is great, their choice not yours or someone else’s. The support teams among peers is critical and I am sure there will be many more informal learning sessions taking place outside of the meeting twice a month. The collection of data from the group is also necessary and a peice I believe is sometimes forgotten. The data is needed to show evidence of use, success, and challenges if the plan is to move forward for others in years to come. I hope you plan to share what you encounter as the year continues, I am interested to follow what you are doing. We have moved toward data driven pilots when we introduce new technologies. I am training teachers tomorrow and Friday on the use of AirLiner slates with SMART notebook software. Teachers had to complete and application in order to be part of the pilot this year. They had to agree to training, complete 27 lessons using the AirLiner during the course of the school year. Come together once a month afterschool for sharing successes, challenges and sharing their lessons with one another. I would be happy to share our year as well, I will be posting on my blog as we go. Good luck you have a great plan in place to ensure everyone’s success. I agree your plan is great and your teachers are very lucky. We distributed to our faculty in the Spring right before school dismissed to familiarize them over the summer (went from pc desktops to macbooks) Will be following your progress as we move forward as well. I’d love to see your form if willing to share! I second Jennifer W. (about the form). I’ll also be interested to see how the program goes and how teachers respond to the laptops (pc or mac?). * Three years? I’ve been blogging about online, interactive, audible history-telling for 4 years, evangelizing it for seven, and experimenting for more. We haven’t made a dent. * “Technology”: I’m a system-of-systems engineer now working in education. I never use the word “technology”. (If I should, I’m talking about nano-tubes, not common everyday devices that surround me like TV, car radio, laptop, or professional workstation). * “Laptop support teams”. What in the world do these teachers learn while they are in college? * ISTENETS: If I were gonna preach standards, I’d start with applying some basic legibility standards to my website. That NETS for Teachers site makes my eyes hurt. * NETS-S “Technology standards” How vague can one get? “Understand and Use Technology Systems”. I wrote the spec for a #*^$%! distributed avionics system, but I haven’t the slightest idea how to use a PSP or iMovie. Do I “Understand and Use Technology systems”? * Content vs. “skills”. My mind was on the “Digital Citizenship” standard when I peeked at your post on “A Personal Stake”. Your God-daughter: A beautiful little girl. What about the job? I was wondering if that meant something, or if its just a title. It should mean that you have taken responsibility for the rest of your life for her moral and intellectual life. That you personally are the one person in the world who will rise up and stand for 5000 years of learning, moral discovery, and the working out by mankind (or the revelation by God, as you choose) of how to govern ourselves as individuals and as nations. So to hear an immediate turn to the blathering that “Skills will be more important than the content itself” is just disappointing. I mean, that’s a nice 70’s term and all, but haven’t we moved beyond that yet? Have we learned nothing from two decades of work on the Cyc project and other CS and Cog-Sci efforts about what intelligence is and isn’t? Not to mention what it means to be a citizen? Digital citizenship shouldn’t have to be a special term. “Thou shalt not bear false witness” is something you have latched onto, or you haven’t. Online or offline. “Love your neighbor as yourself” really doesn’t need special addenda or codicils. Content matters. And it matters which content. Some lasts and builds intelligence; some doesn’t. Every person in America needs to know that Rome had representative government and gave it up. And they need to know that 1000 years of chaos followed. That’s intelligence if you want to live in a free country. We need to know math. Our engineering, science, and medical schools are filled with foreign nationals looking to take those skills back home. Which is great; except that we’re not learning those skills as we did. And by skills, I don’t mean power-pointing and blogging, I mean partial differential equations and Fourier transforms. And to get to the point where you can learn that, you need a whole lot of facts and rules about math, learned the hard way through K-12 schooling. I hope that these laptops are tools for accelerating that learning. I hope; but I wonder. Four years of blogging and some odd years of tinkering don’t actually make you an expert or anything more than a novice. And I’m sorry, Since surfing the web via 1200 baud modem and limited to bulletin board dial-up links, I’m afraid a huge dent has been made. I find it extremely curious that you only classify the most complicated of systems as technology. It was my understanding that a screwdriver, paper clip, space shuttle, and even fancy nano-tubes are a form of technology. Ones that merely vary in complexity, not necessarily usefulness. What’s confusing about your relationship with technology is that you are a self proclaimed history buff. I’m certain that when Jeff’s God-Daughter gets to school she will have teachers that have just now graduated from college… Hmmm where would they be if they didn’t have a friendly forum to support them as they adapt to changing technology. And on a side note…. Were we supposed to be impressed by your ability to write a ‘spec for a #*^$% distibuted avionics system.’ Sorry bud, didn’t happen. I have read Mr. U’s posting on ‘A Personal Stake.’ Now that posting was not confusing and seemed to be fairly concise… “Sitting in a position to prepare for the future… how do I set things in motion to best serve the students of 2023.” Not exactly a pithy endeavor. blathering???? Did you actually read you post before you sent it? Last time I checked the Thinking Stick was a forum for individuals (or groups) to discuss topics of the day. Which is why your post wasn’t immediately deleted. An interesting thing to note is your reference to what, “every American needs to know.” Since when was being a digital citizen Amero-centric… Or based off of principles of the Roman Empire. THAT is intelligence if you want to live in a global community. I’m afraid that Fourier transorms and differential equations are gloriously long and elegant words. They are also things which are learned and regurgitated and used out of context to the bigger picture. I’m afraid it is the judicial, ethical, and innovative use of those skills that makes ‘learning it the hard way’ (regardless of whether you learned to cook or program computers) that is important. Now sir, I’ve spent more time and more characters of computer coding on your post than anyone has spent on any of your postings on your website. And I’m afraid that it was probably more than it deserved. You don’t mind do you? I’m trying to read the posting of an innovator and a thinker. Glad to hear someone else is trying an individualized plan for teachers using tech. I’ve found principal buy-in is the critical piece. I’m getting my ducks in a row, too. I have tagged you on my blog for the 8 random things meme. (The meme thing is new to me.) Don’t feel that you have to respond to it. I just wanted you to know that I really enjoy reading your blog. I guess the newbie quip is one of the things that escaped you: ’twas intended to be an affectionate reminder that 3-4 years of working at something is too early to get dejected and contemplate quitting. The road ahead is too long, and many of us have put in way more effort, still waiting on the seeds to germinate. Technology is the exciting things to come, where computers help us learn more, faster. With rare exceptions, Wikipedia and a few math help forums are really the only things dramatically changing education so far. In fact, barring a sharp change in the current direction of things, the main way a PC will affect education in the next few years is as a funnel to an iPod. If things go well. Europeans and others do OK with their history and civics; American learning in those topics was poor, and to this day, continues to decline. That is a problem. It happens because we refuse to teach facts and content. I am not “a history buff”. I am a victim of 21 years of inadequate teaching, who just seeks to be minimally culturally literate . The failure of those teachers to teach content is why I put so much time into the project, and why I visit blogs like this to remind what is important, and what is fad. Kids blogging is fad; learning content is important. And, because in our urban schools, fifty percent of young black Americans do not graduate. Fifty percent! The road to reclaiming those kids is long and hard. Are you kidding me? The use of digital storytelling in my inclusion classroom allowed my ESE students to see success, for many, it was the first in a long while. The use of the podcast allowed my same ESE students a chance at being able to express themselves on topics related to the curriculum without saying, ok let’s write a 5 paragraph essay and move along. The key behind both of these examples is that it was FUN for the students to partake in the activity. Isn’t that what we are in the business to do? To facilitate the learning process of our charges? Again sir, it might be a fad. But if it is a way for students to write, without the stigma of sitting down and ‘writing an essay’ then why not use it as a tool to, well, write? Is it not true that students who write, and write often, become better writers? Why not offer our students a way to do that? You sir can keep your wikipedia and a ‘few’ math forums. I will continue using these ‘tools’ that have worked for me, and I’m sure for countless others. That’s the beauty of the world we live in isn’t it? Choices? Tom, Hey, and thanks for the response! Well, the first thing is, that when I say “education”, I’m speak of the whole. No doubt that you were able to make use of some of the latest gadgets to reach a select group of kids. But, I’ll argue, you could have done the same at any point in time with the resources you could find around you. Because, I’l wager, you are an above average teacher, committed to creatively reaching the kids. A couple of nun friends who work with severely handicapped kids reach them another way. So, if computers, cameras, and iPods help you accomplish the mission, great! I’m saying, lets keep our eye on what that mission is. For example, learning to write well. A blog is still just a blank piece of paper. If the time overhead of using the blog does not take away from content instruction, fine. use it. As long as someone is still there with Strunk and White in hand, showing the kids how to craft better sentences. And actually, students who read tend to become better writers. So, again, there’s that content thing. Well, no. Teachers are in the business of filling kids heads with Shakespeare and Franklin and Michelangelo and Bach and Newton and Einstein and Locke and Adam Smith and Tesla and Mendel and Socrates and David and Ghandi and Kennedy and Muir and….you know! What we’re seeing is now a fifty year downward trend at the teachng of those things, so much so that the teachers now don’t even know many of them exist. There are schools which teach all of these things–and many more–with a vengeance. Whats cool is, the more exposure to the classic stuff the kids get, the more excited they and their teachers become. We heard from a principle in the southwest who just could not believe the energy that was infused into his classrooms when they switched to a high-content curriculum. Beyond the Basics: Achieving a Liberal Education for All Children is a good first resource for assessing content delivery verses other uses of classroom time. Check at EdExcellennce.net for the conference and the report. After reading the quote that you dubbed me for. Let me take a moment to fix my mistake. I should have asked the question, “Isn’t what we are in the business of doing is to help our students learn.” Taboo on my part for not re-reading before I clicked submit. I used my ESE Inclusion students as an example because the typical viewpoint of these students are of low achievers. Fault not on them. However, my regular students in those classes enjoyed the same amounts of success. I don’t view the ‘gadgets’ as you call them, I, and I’m sure as most of Jeff’s readers describe them, as tools. Sure, they are fairly new, with new technologies and concepts coming out on a daily basis. That’s the beauty of technology. We didn’t start out using a knife, is there not proof that the earliest knives consisted of chiseled down stones and bones? Please don’t confuse my goal in education as being to teach our students these gadgets. My goal, as you stated yours is as well, is to teach them ‘concepts’. Again, once I employed these gadgets as you call them. Learning increased. Participation increased as well, along the entire spectrum of students, race and ability levels. Our students these days learn differently than the generations before. Rote memorization of historical facts and dates is just not enough anymore. Thank God for Ms. Sarah Jane Hartley, who stood their with her crutches and arm braces and, lifting one arm with the other to point, forced us into memorizing the name and location of every single country on earth. And for the music teachers who led us into learning “America the Beautiful”, and “Roll on Columbia”. I’d have been much less silly in my early years. The poems, speeches, and writings learned by rote remain in mind, ready in a boardroom, factory floor, field of battle, on a bus with pen in hand, or God forbid, celled alone in a prisoner of war camp or cast away at sea. My regret is hardly the time spent memorizing, rail against it though I might have. Rather, I detest the blocks of time that could have—should have—been spent memorizing. Video games are very good at making people learn things mostly by rote. The web…not yet! This is a great way to implement and grow technology. Our District started a new program last year called Teach 21. Teachers who sign up for the program receive Whiteboards, 5 new desktops, a new laptop, projectors, document cameras and a creation station in each classroom. In return, they complete 200 hours of professional development designed to expand their minds and help them make technology integration a daily part of their curriculum. They are required to keep a weblog of progress, frustrations and victories. At the end of the first year they submit a Capstone project to be implemented the next year. They proposal includes any tools they need including digital cameras, video cameras, podcasting mics, etc. We had around 300 teachers sign up the first year, last spring we added another 300. It is so exciting to be part of the revolution!! !